Lu Over The Wall | Anime etc. A parent choosing a cartoon film for his or her children may view Japanese titles with understandable suspicion. Although anime has a far family-friendlier reputation than it once did, anime films which look like they’re made for children can be deceptive. They may mutate into bewildering allegorical journeys (Spirited Away, 2001) or into teenage dramas (The Boy and the Beast, 2015, Napping Princess, 2017). The whimsical-looking In This Corner of the World (2016) had decidedly adult, fleetingly horrific, content. The media no longer identifies anime with X-rated “manga movies”, but even its gentle fare can stray well outside the safety nets of Disney and Pixar. 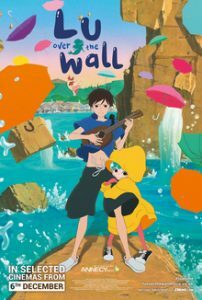 Lu Over the Wall is an exception; it’s very much a children’s film, though not entirely. It will remind non-anime fans of Disney’s Lilo and Stitch (2002), while any Ghibli fan will think of Ponyo (2008) by Miyazaki Hayao. Both Lu and Ponyo are set in modern-day Japanese fishing villages, where a boy encounters a magic sea being with the personality of a little girl. Both films culminate with the villages being spectacularly flooded, but with no loss of life – a fantasy that inevitably looks different in a Japanese film made post-2011, when the Tohoku tsunami killed more than fifteen thousand people. Even Lu, then, is not “simply” a children’s film. Moreover, while the boy in Ponyo was a primary schooler, Lu takes the viewpoint of a withdrawn teenager, Kai, angered by his parents’ divorce. His meeting with Lu is presented overtly as therapy. Lu, drawn with a manically beaming face and a fish’s body, just wants to dance, sing and befriend everyone, and teaches Kai and eventually everyone else to let go of their resentments, regrets and blocks to their self-expression. The fact that Lu is a child and a cartoon character lets her get away with being a Manic Pixie Dream Girl (Nathan Rabin’s name for a “bubbly” fictional female who cheers up male characters without an inner life of her own). Lu is legitimately delightful through her sheer joyous energy, whether jumping up from the sea to grin at Kai through a window, or leaping around in dances that turn everyone else into revved-up cartoon dancers too. Her sweetest scene, though, is more restrained; she visits the shore to go on an evening walk with Kai, who teaches and teases her as if she’s a beloved little sister. The scene feels genuine enough so it doesn’t feel hypocritical when the story criticises adults for turning Lu’s cuteness into a brand to bring prosperity back to their town. After a delightful first half, the second is surprisingly sloppy, though not fatally so. At one point, a girl vanishes and the villagers fear Lu has eaten her (!). The main characters are given ample time to explain the mistake, but don’t get round to it until Lu’s facing a terrible fate. The flood finale is also clumsy. The deluge in Ghibli’s Ponyo was a natural development of the film’s wonder; in Lu it’s unconvincing in the film’s own terms, being a curse triggered by Lu’s peril even after Lu has been saved and the film has reached its natural end. At least the animation in the flood finale may appease fans of the director, Yuasa Masaaki, who may be dismayed by how “mainstream” Lu looks. 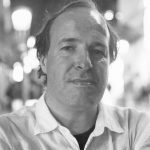 Yuasa directed this year’s The Night is Short, Walk on Girl, released just weeks ago, and he’s celebrated for his adult, anarchic sensibilities. Actually, Lu’s look works well; the film’s bright-coloured characters have cheerfully zany expressions that let them stand out from the flattened backdrops (Kai’s male bandmate also has entertainingly silly walks). The first half occasionally echoes the Irish cartoon Song of the Sea (2014), especially Lu’s quietly funny mer-dog. The second half has bursts of wilder animation, such as a giant walking shark (Lu’s father) who catches fire as he lunges through the town, and a beautiful, near-abstract flashback in which a drowning diver encounters a mer-creature who seems both monstrous and angelic.